Home CULLINGFORD, Cedric (editor). Parents, Education and the State. Parents, Education and the State. Title: Parents, Education and the State. The role of parents in the education system is crucial and increasingly recognised as being so, not only by teachers, but by parents themselves and politicians. 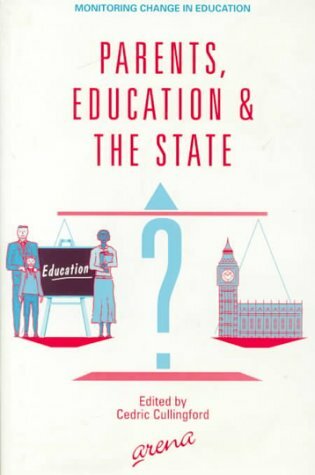 Parents are seen to have an influential part to play in support of schools and are also asked to take a more controlling role.<br />This book examines the reality of parents' place in the education system: How important is their contribution? What do they think of it? What do teachers and children think of this? What kind of impact do parents have on the academic and social futures of their children? And what do parents think about the political changes?<br />This book brings together original research and distinguished contributors to deal with important issues. It analyses what is going on based on empirical evidence from parents, children and teachers, and draws out the political implications. ABAA, ILAB, IOBA, and Southern New England Antiquarian Booksellers. Independent Booksellers since 1987. Grendel Books, ABAA/ILAB, 18 Ireland Street, PO Box 98, West Chesterfield, MA 01084-0098, (413) 296-0099, grendel.javanet@rcn.com, www.grendelbooks.com. All listings are subject to prior sale. Please contact us to reserve books in advance. We will hold books for ten days, pending payment. All orders should be prepaid. Payment may be made by personal check, money order, credit card, or PayPal. Institutions can be billed to suit their needs. Massachusetts residents please add 6.25% sales tax. Mail) starting at $9.00 for the first book. Shipping cost may be slightly higher depending on weight of book and shipping destination. Media Mail shipping rate is also available: $5.00 for the first book and $2.00 for each additional. Overseas orders are billed at cost. Address: West Chesterfield, MA, U.S.A.